For contact information, visit the Contact Page. For a list of upcoming events and appearances. visit the Events Page. 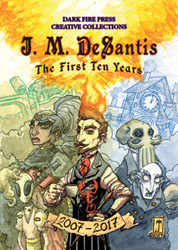 J. M. DeSantis (born Jeffrey Michael DeSantis) is a writer and artist (Write-ist™) who’s work has appeared in many diverse industries, both self-published and traditionally published, including prose fiction, comics, websites, copywriting, and even film (Night of the Living Dead: Reanimated). He is the author of a number of short stories, books, comics, and artworks, mostly in the fantasy, horror, and humour genres, and is the creator of the South Asian dark fantasy heroine, Chadhiyana (chadhiyana.com). 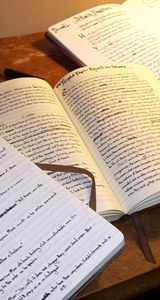 Among his published works are J. M. DeSantis: The First Ten Years, six issues of Chadhiyana and a number of forthcoming works including: The Tainted Ones (comic), Robert Phillips (novella), Ghosts Were Are People Too (children’s book), and his novel, The Kirklyn Horror. 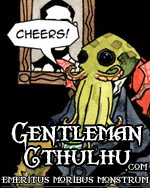 He is also the writer and artist of the humorous horror web-comic, Gentleman Cthulhu: Emeritus Moribus Monstrum (gentlemancthulhu.com), which has seen three published collections through Dark Fire Press. Aside from his original works, DeSantis is also known for his depictions of Lovecraftian horror, his unsettling illustrations of Wonderland, and his deep obsession with Count Orlok (Nosferatu, 1922). He works traditionally as an artist, mixing watercolours, inks, acrylics, and coloured pencils. Both his writing and art are marked by their dark themes (even humour), deep psychology, and intricately developed worlds and designs. He currently lives in his native New Jersey where, when he’s not balancing the numerous projects his mind is constantly conjuring up, he enjoys escaping into books and video games, going on hikes (with and without four-legged companions), and enjoying the real-life company of his family, friends, and students. 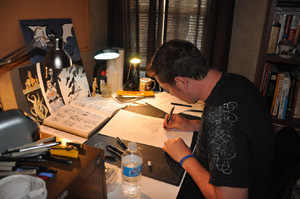 He teaches Studio Art and Graphic Design. Rosarium Publishing, Heavy Metal Magazine, Inbeon Studios, Little York Books, Neoflux Productions, Atlas Unleashed, Innsmouth Free Press, Arcana Comics, Norgus Press, Alterna Comics, Book of Lies (web-comic), WILDsound, Static Movement, Planet Lovecraft Magazine, Guild Works Publications, the Comicbook Artists Guild, Flush Entertainment, his own Dark Fire Press, and a number of independent commissioners. Christopher Nolan, Tim Burton, and Ridley Scott. Soulsborne games (Dark Souls series, Bloodborne & Demons’ Souls), Vagrant Story, Castlevania (series), and Final Fantasy Tactics. Art Teacher. Ridgefield Park Public Schools; Ridgefield Park, New Jersey. September 2013 – current. High school and middle school studio art and graphic design teacher. Also run a comic book club which teaches the comic-creation process. Guest Art Teacher. Englewood Public School District; Englewood, New Jersey. Taught two comic book creation workshops during; one two-week, one single-day, multiple periods. Bachelor of Fine Arts – Computer Animation.